For those living close to nature, the monsoon is the season of contradictions. It is the season of crops growing and of hopes for food security in the following year, but it is also the season when foodgrains run short. It is one season that offers the widest range of food—hundreds of varieties of wild vegetables to pick out from, swamps full of crabs and rivers and streams brimming with fish. Yet it is also the season of most illnesses—fever, flu, chills, worms, body ache and diarrhoea. Monsoon ensures survival for the whole year, that is, if, you survive it first. Among the tribals of Maharashtra, one of the strategies for surviving the rains is to consume bitter vegetables and herbs. Some are consumed as decoctions, or kadha. But most are relished as seasonal delicacies with faith that they are good for health and should be eaten. For instance, in Yavatmal, a district in the Vidarbha region, tribal communities consume tender fruits of ekdodi (Dregea volubilis) during the early monsoon. 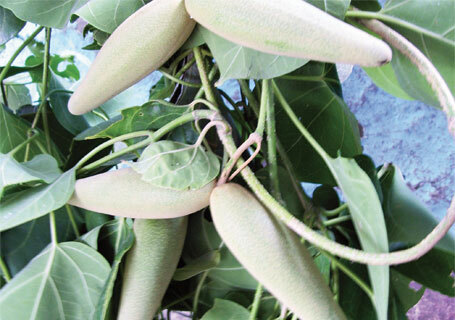 They believe the bitter bottle gourd-like fruit growing on a woody vine helps prevent monsoon-related sicknesses. “But they also appreciate its flavour, and a simple preparation of ekdodi with potatoes and onions is a common dish in every family in July,” says Madhukar Dhas of Dilasa, a non-profit which has studied the nutritional practices of tribals in the region. (See ‘Recipes’ on facing page). In Gadchiroli, a tribal-dominated Vidarbha district, people eat an assortment of bitters, a different variety each month. Towards May and early June, when kuda (Holarrhena antidysentrica) is in full bloom, it is time for the Gond tribals to prepare for the delicious kuda chya besan. The plant grows profusely in the hills. 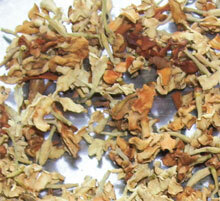 The Gonds pluck its tiny, white flowers, dry them and store them for consumption during the rains. Later, with the monsoon well on its way in July, both tribal groups consume a small creeper (Glossogyne pinnatifida), which they call kadu bhaji. Come August and September, it is time for the tender beans and seeds of kuda. “There is a general understanding in these communities that bitters should be consumed during the rainy season for year-round good health,” says Jamkatan. The Kanwars have always eaten a lot of bamboo shoots, which have the same benefit as bitters, during the monsoon even before they started learning about kuda. 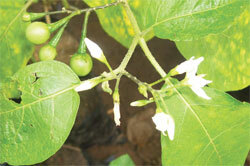 Consider chichurda (Solanum anguivi), a tiny, pea-sized brinjal. This is the most popular bitter vegetable during the rains for Mahadeo Koli tribals of the Sahyadri Hills in western Maharashtra. “The more frequently you eat it in the season, the better your health will be for the rest of the year,” says Dhondabai Aswale, a Mahadeo Koli of Ahupe village in the Bhimashankar hill in Pune district. “One should be careful not to eat too much of chichurda at one go because it can make one feel nauseated,” he cautions. This Ayurvedic herb, known as chichurti is Sanskrit, is also available in Gadchiroli, says Pradeep Saudagar, a microbiologist who documents tribal health practices at AAAS. But it is not consumed as a vegetable there. Tribal healers, known as vaidus, use the plant to prepare medicines. 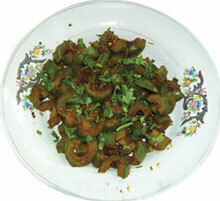 Saudagar says apart from vegetables, several tribal communities consume decoctions prepared from bhuinimba (Andrographis penticulata) and bhui amla (Phyllanthus niruri), both known medicinal herbs, periodically to ward off monsoon-related illnesses (see ‘Why bitter is better’ on opposite page). In Gadchiroli, however, AAAS has been able to tentatively link at least one ailment to the lack of bitters in food—intestinal worms. Says Saudagar, most tribal mothers here feed seeds of vavding (Embelia ribes) to their children to eliminate worms. It is believed that teens and adults do not get worms as they eat bitters. However, during a study, AAAS found severe worm infestation as the leading cause of anaemia in teenage girls. “While it is very likely that the decline of bitters in diet is a culprit, more study is needed to draw the conclusion,” he says. Scrub the brown fuzz off ekdodi fruits and wash thoroughly till the light green skin is smooth. Cut in half lengthwise and remove the hairy seed cluster from the centre. Chop the rest of the fruits into small pieces and boil in a pan with sufficient water till they are soft. Drain the water. Chop the other vegetables into small pieces. Heat oil in a pan and splutter mustard and cumin seeds. Add onion, ginger-garlic paste, salt, turmeric and chilly powder. Cook till onion gets soft. Add potatoes and cook till soft. Add ekdodi and tomato pieces. Cover and cook on low flame till done. If required, add water while cooking. Serve hot with chapattis or rice. Wash the flowers well. Boil till soft and drain the water. Heat oil in a pan. Add mustard and cumin seeds. When they start to splutter, add onion and garlic. Add salt, turmeric and chilly powder, and stir till onion and garlic are soft. Add the flowers and cook for a few minutes on low flame. Beat curd and gram flour together. Add water to make a smooth paste and pour it on the cooking flowers. Mix well. Add more water if necessary to achieve the desired consistency; the dish thickens as it cools. Bring it to boil and allow to simmer, stirring intermittently to prevent burning. Cook till the ingredients are mixed evenly. Serve warm. This is a good post for the frequent readers like me. I appreciate your effort for giving messages about conservation of nature. The civilization and industry development have itself shown that they are destroying the nature. The local government should take ways and means for the protection of nature. Keep sharing. Protecting the nature should be a top priority for the government.